Happy New Year fellow travellers. Camilla, having scoffed a whole turkey, a home-baked Christmas cake and a 12 pack of mince pies decided that an 8 miler in the mud was in order. This was good even though I, of course, had not had any turkey, Christmas cake or mince pies, who knows perhaps I would bag a pheasant on our way round the Ardingly Balcombe circular walk, ha! Well watch out at lunch. It was pretty nippy, I could tell as the team had silly hats on and Camilla even sported some wooly gloves, nothing like stylish ey talk about letting the side down. I merely rolled in sufficient mud to provide me with a natty organic coat, nothing like a Beardie rolled in Sussex clay – beeeuuutiful. 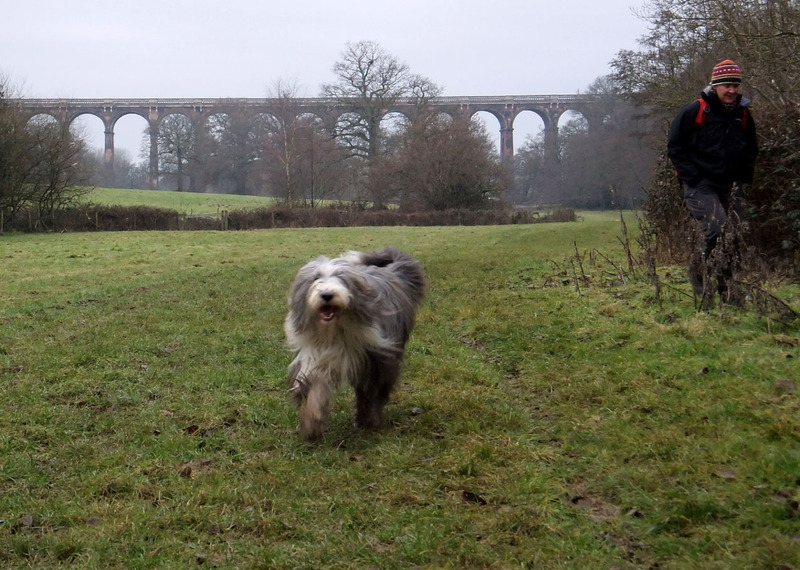 Camilla has a new camera, which I understand as I am after-all very handsome, but twenty photos of the Balcombe viaduct, (aka Ouse viaduct), seems extreme. 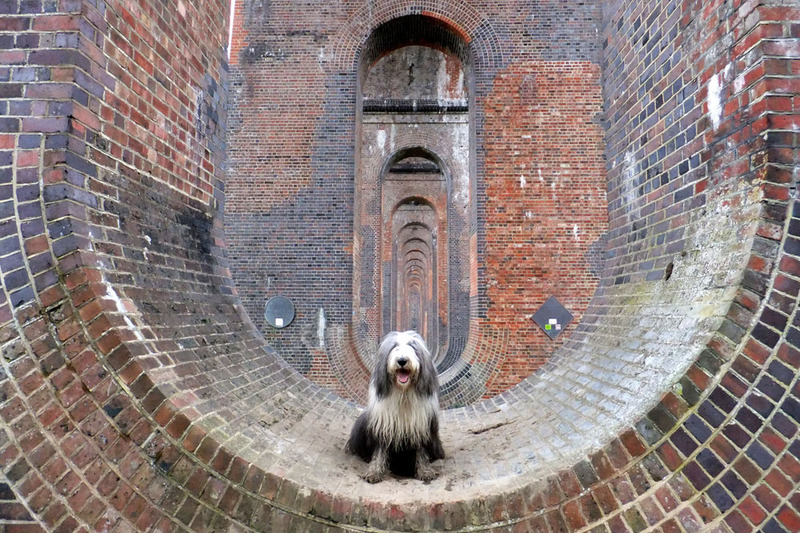 OK Annie tells me it is made of 11 Million bricks, has 37 arches, was built in 1841 and is used by over 110 trains every day – how exciting – yawn – oh dear! OK so the viaduct makes for a good pic, because I am in it! We strode on, as ever, two little detours very early on (well done Millsy) but we eventually made our way to lunch, at the Half Moon Pub in Balcombe. Apparently this place has not been gastronised hence still sported the traditional worn carpet, dart board and a pub menu that folk could afford. Come on girls get something I can nab, steak and kidney perhaps? Oh well done Camilla, ham-egg-chips, yummy now lets see my moves. Brilliant she cannot see me....here I come. Quick pit stop then straight into the second phase or our mud fest. Take note this walk is VERY muddy so even though only an 8 miler it made for slightly slower walking, that and the inability of girls to read maps – Bodge help. After the quick detour, yes another one, we found our way to the East side of the reservoir and it was well worth the wait; silent, mostly frozen and v v picturesque. 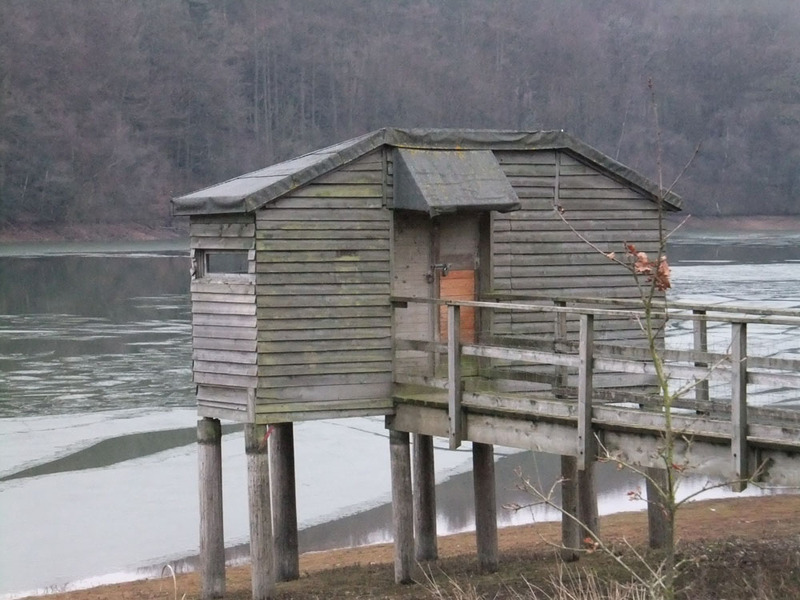 The lake house, room for one! A walk without challenges, the light was poor for our day but this is a walk that is well worth doing. 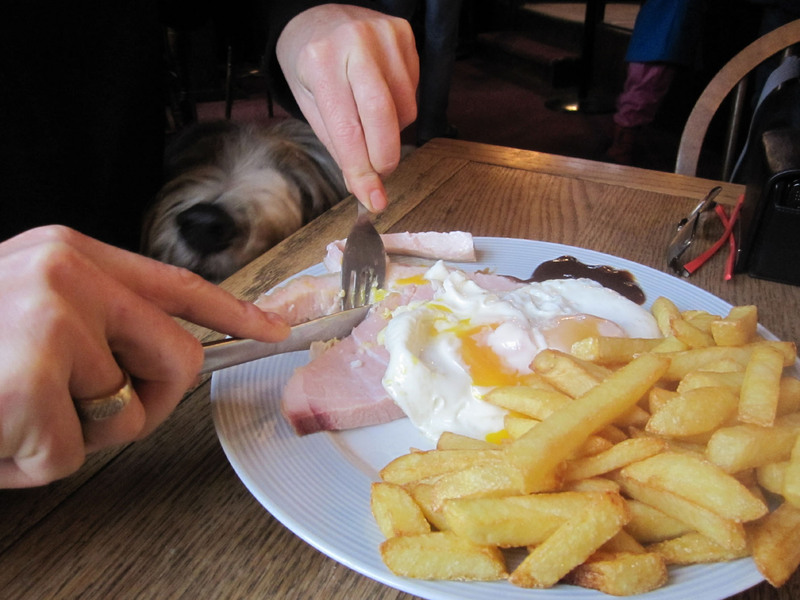 The Half Moon is a bit tired but was excellent value and that ham was 100 % home-made and carved, yummy woof woof. Rufus Rambles into 2011 and is still loving it. OK who threw the snowball? I am Rufus Wainwright Hurst the 1st and I am regarded as the most handsome dog in Sevenoaks, now look at me. Come on who was it? Check out the jacket….cool or what? The snow down here on the North Downs is still hanging around today the 13th of December, unbelievable. I love it, slushy mushy, muddy, fabulous but a little cold hence my new stylish jacket. Would this be a gilet? 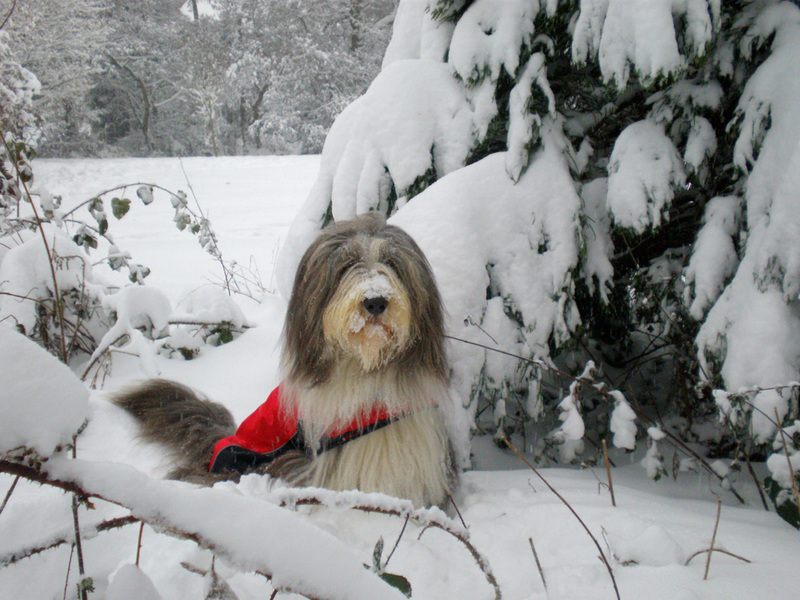 Happy Christmas and New Year to all my readers more walks in the New Year, if not before, so keep coming back to say hi, leave comments and let me know if you have any questions. Ps Annie’s Sloe Gin is not ready for Christmas, no one is thrilled about that, hee hee hee I don’t get given any so I don’t care. 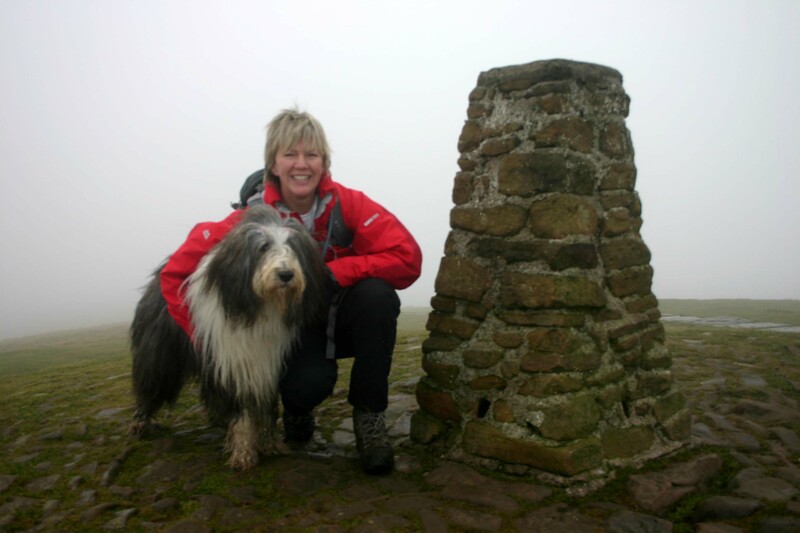 Up to Derbyshire and on the trail at 08.00 hrs Camilla and Annie had, of course, tucked into bacon baps before we engaged, what did I get? Nought – absolutely nada – nothing – rien…..grrrrrr! 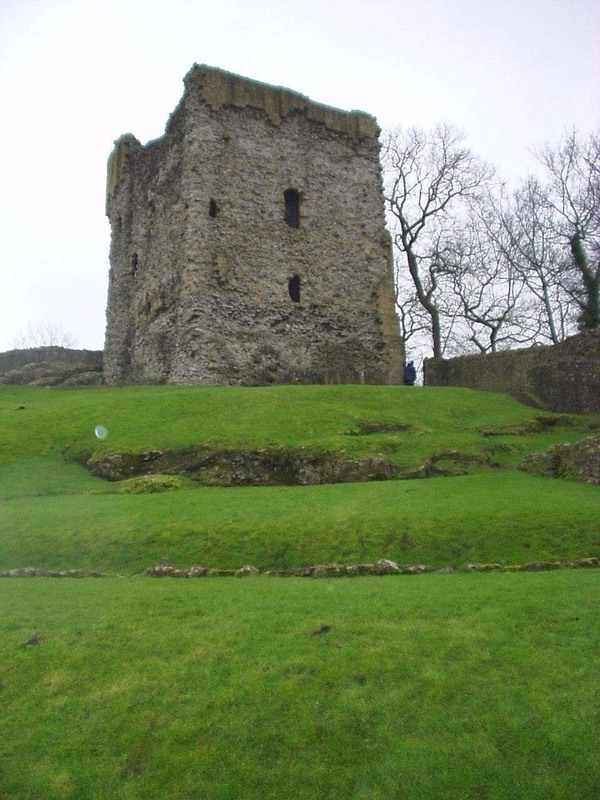 We marched on, through the low mist trekking past a ruined castle, Peveril and then up-up-up through the Limestone way. It was a little squelchy under foot, lovely and muddy…..woof, as we headed for the first of our “planned” going wrong stops….I think they are planned as we do always have them, Camilla? These little Derbyshire bumps are dead lovely but not mega challenging for the team, which was grand as I was absolutely starving come on someone give me a snack. 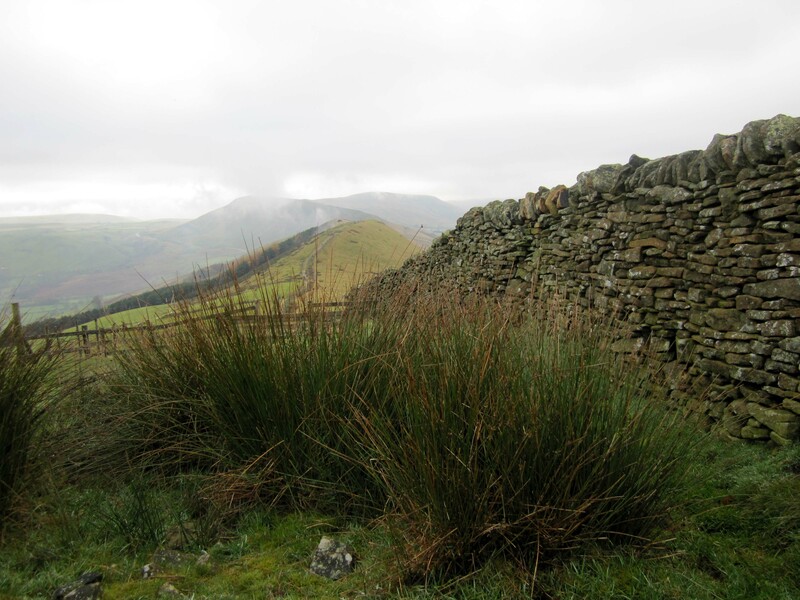 Mam Tor is an ancient hill, iron age, and well walked so now has a stepping stone staircase for our comfort and to reduce erosion. At the top I was promised great views of Derbyshire, but this was not to be, at the top of Mam Tor we could have seen angels as we were so deep in the clouds…. (see pic of me looking rather handsome, sorry about your pic Camilla). As we passed Mam Tor the weather improved and so the views improved. 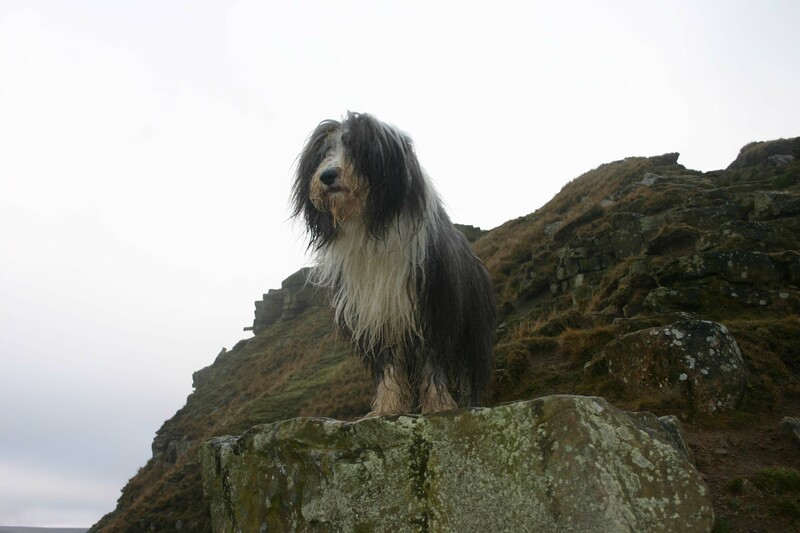 Very few walkers tho’, come on lazy louts of Castleton, I need picnic crumbs…. The route continued down to Hope where we found the apparently famous Woodbine cafe, no time for a snack apparently, unbelievable….I HADN’T EATEN YET! The weather might be better but the mud got muddier, ha ha,…..onwards to Castleton alongside the fine river, a quick dip for me, for a pint and a pie I hoped. Well they had a pint at the George but I didn’t get a pie but some measly snack from the publican. Not happy…not happy at all, and they haven’t even noticed. On the route to the Woodbine cafe for a pie I hope.. Missing out on the event of the year, the Castleton Christmas lights, we made a quick dash over to Stanton Moor to investigate the trial bikes, four-wheel drive fanatics and the fogtastic weather….girls what are you thinking where is Bodge when you need some sense, logic and reason…? Sunday is here and what a few days I have had, to be frank with you reader, I am absolutely shattered and rumour has it that we are pillaring today, that might look like a verb and it certainly might be one if we do it, aka climbing up a very very very steep tonne of rock, getting to the top and doing more and more and more. I am liking this holiday a lot as the team have bought heaps of Cumberland sausages for my breakfast, lucky lucky boy. Camilla is not shy of eating a few as well, watch out Millsy need to walk a lot to keep those pounds off. Anyway the day looks pretty grand with heaps of sun, not as grand as yesterday but good enough for me. 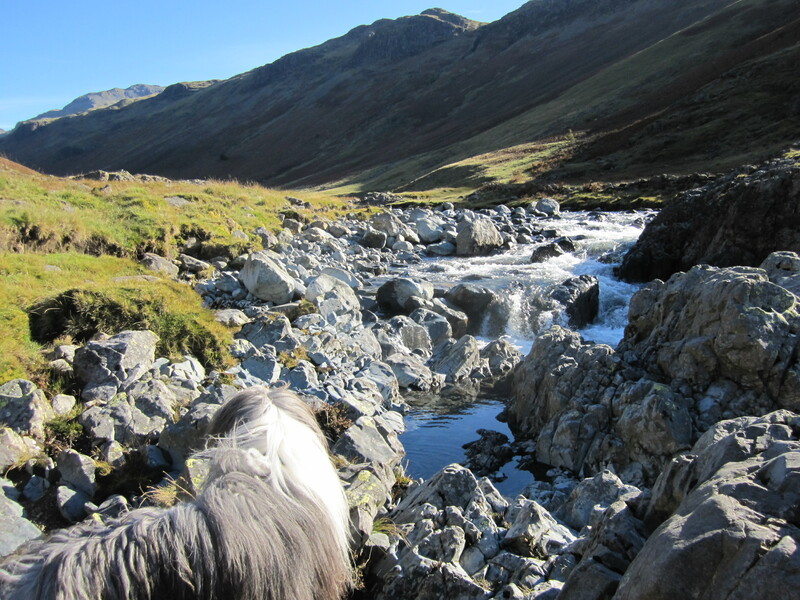 Take a sticky at the pics from Wastwater, its not a dog’s life up here I can assure you, if a dog’s life is a bad one…..?! 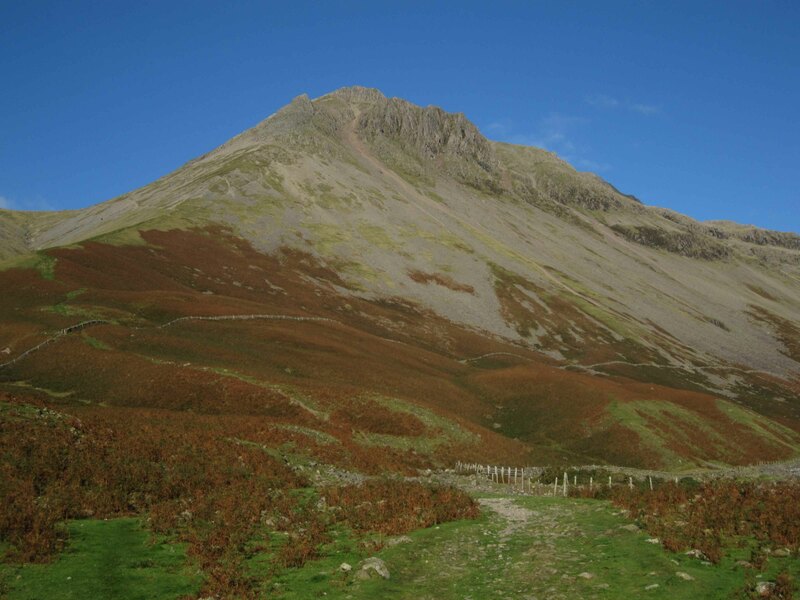 We all chunkered up Mosedale, a stair case of a walk kindly provided by mankind, a little river crossing, into which Camilla threw her rucksack last time, dunderhead, nothing untoward occurring this time though. 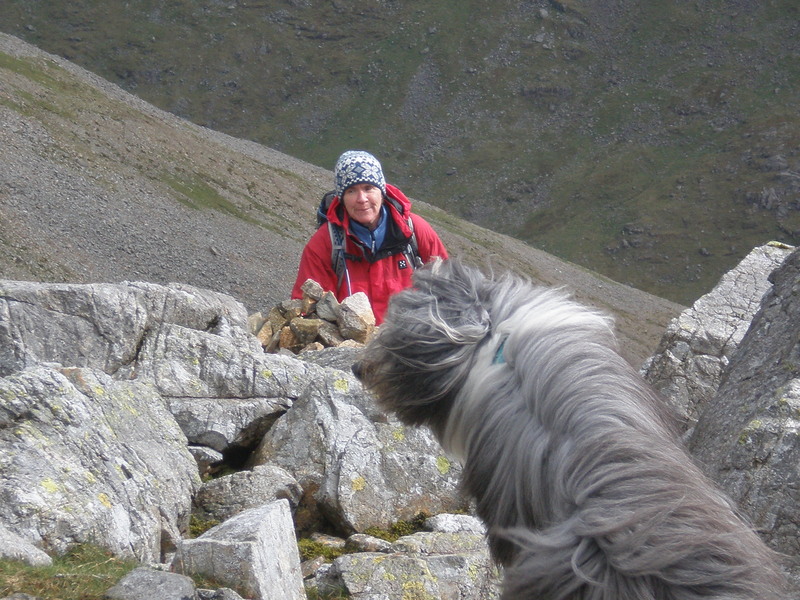 Ummmm hang on, as we get to the top bit it seems there is a bit of a gale running….oh dear oh dear oh dear, Millsy won’t like this at all. Wind, an exposed mountain and some v steep and sheer edges. I see a bit of aimless coming along. The weather had changed, still sunny but far tooooo windy miller for a trip up Pillar, it would end up being a trip of a lifetime so we changed tack and headed toward Black Sail pass but then did a swift detour along the back of Kirk Fell with a stride down the side of Great Gable via the gulley between it and Kirk Fell …..not a soul to be seen, not a stranger’s picnic to be snaffled, blow. Where is everyone? Annie struggles a little as we appear to be scrambling down a waterfall, has Camilla got the map right? Camilla resting on her laurels, Annie made a huge picnic with porky pies, delicious sandwiches, satsumas and all sorts of lovely, I got toast and one sausage, hrrrmph not fair girls. 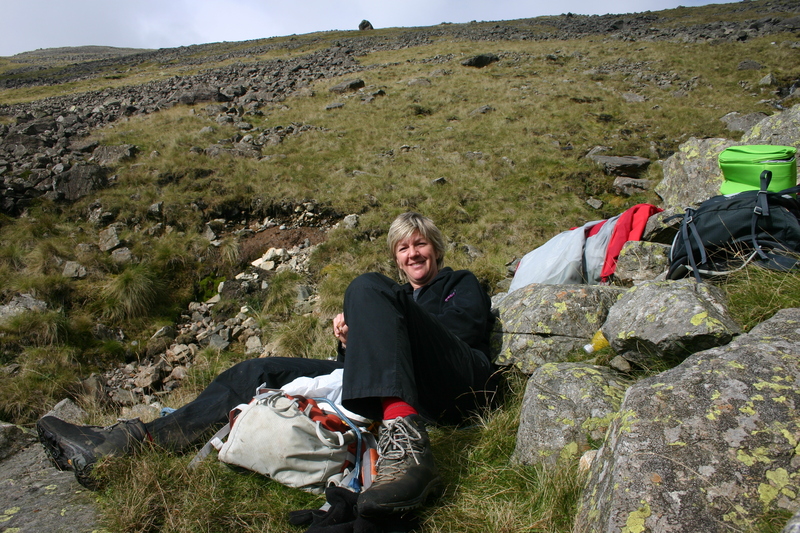 As I am so hungry I wanted to post a photo of me that shows me off in all my glory, to be clear this is on the Scafell Pike day so a not really for here but I look soooo handsome it is almost a sin not to post it. 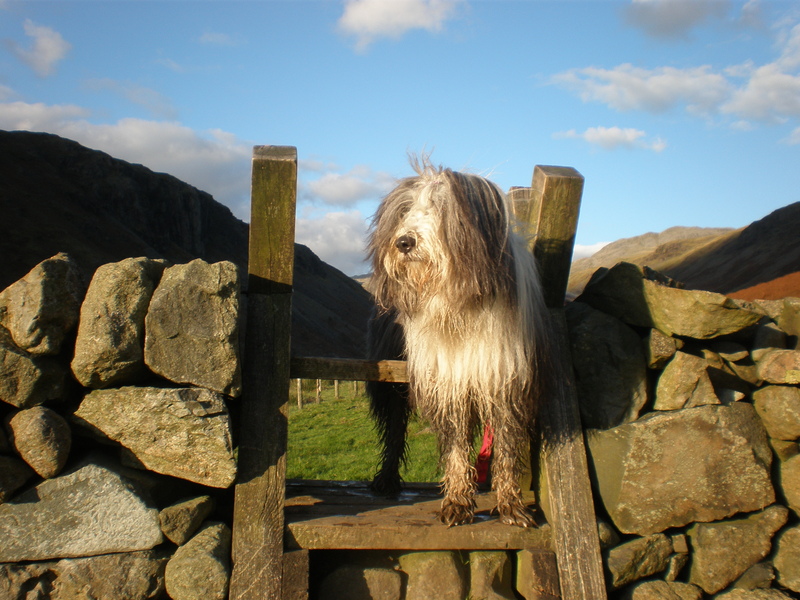 The sun is shining, the weather is warm and even though I am a dog I know how special this is going to be…just take a look at the river Eskdale….the fields are full of Herdies – which I do NOT chase and just well… everything is grand. The team did not think much of the sodden fields with every foot step soaking their GoreTex boots more, I with my padded paws had no troubles at all and had a merry old time in and out of the river. As it happens the girls dipped into the river too as a slight recalculation of the route, Millsy…, took place and a river crossing was decided upon. We carried onto Great Moss an immense flat area of grass and boggy peat, glorious glorious day. 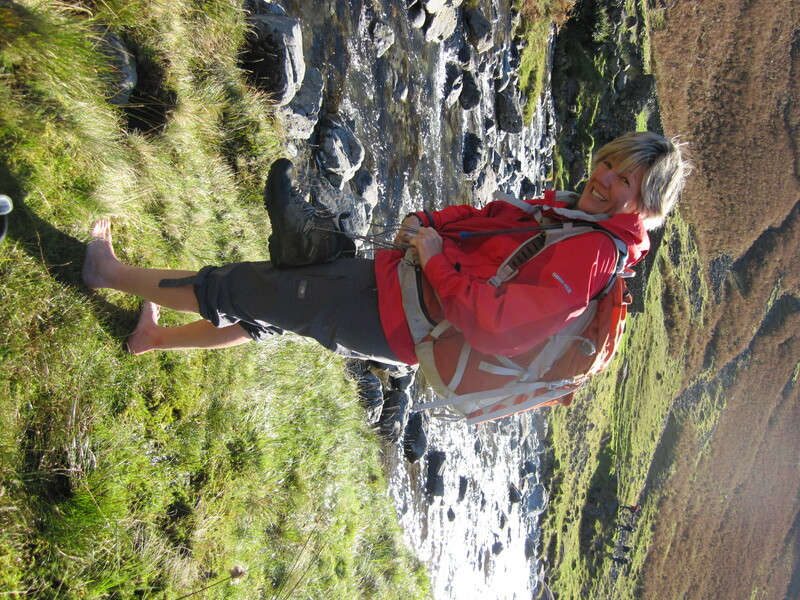 Barefoot before crossing the Eskdale....what went wrong? The day continued with sun shine, meadows and then a pretty steep climb up Little Narrow Cove, a site of various mishaps to walkers in the past. Annie, not as fit as she thinks in spite of the ergo, struggles with some of the bigger rocks. 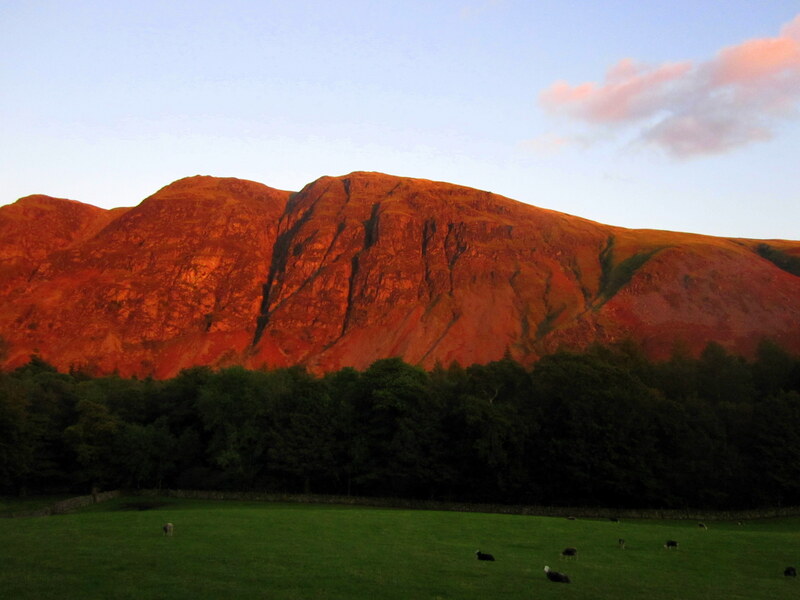 Today is supposed to be Scafell and Scafell Pike, as Bodge would say…. Oh dear…have they bitten off more than they can chew? We make it to the top, very mean picnic on the way …cheers ladies much appreciated NOT, and discover approximately 1 million people, 40 dogs, several children and best of all the debris of 1000 sloppy picnics….but the views are well, amazing. yee ha. 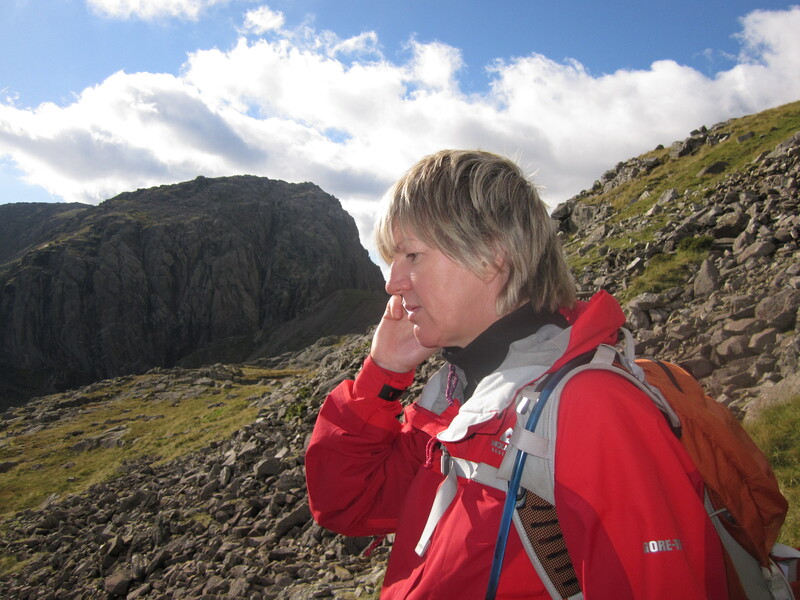 The day continued with a tramp down the side of Scafell Pike with a view to a tramp up to Scafell, not on your nelly I thought as I spied the rock face and scramble we were about to embark upon. Ha ha, have they got this wrong…or what. 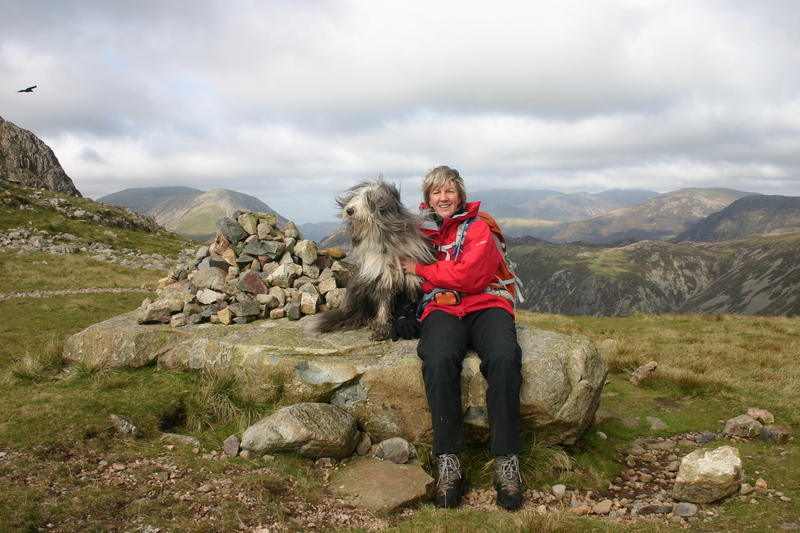 Camilla, genius navigator, did not quite find the route down Scafell Pike and so it was another hill scramble, no trouble for agile Beardie but Annie found the trip hard going, Camilla took time out to phone her Ma so clearly v relaxed. Come on Annie you can do it... or can you? OK so the team are bunked up in this excluuuusive apartment with minstrels gallery, views of mountains and a kitchen of its own. This is good as the chances of snacks are greatly increased when they do not involve thieving sausages from b’fast. Excellent as expected I started the day with a big helping of Cumberland. 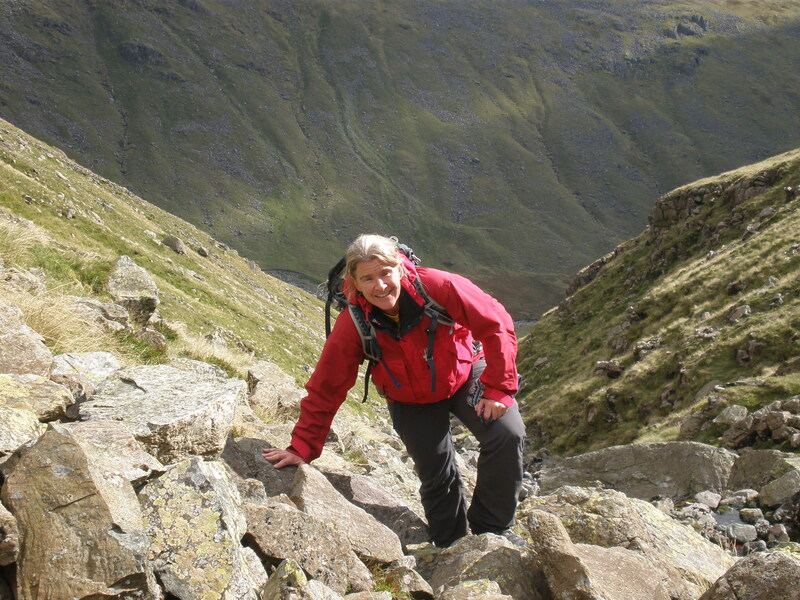 It turns out that was just as well as the first trek took me up a stupidly steep thing called Kirk Fell, in my humblest a fell should not be as big or as steep as a mountain. 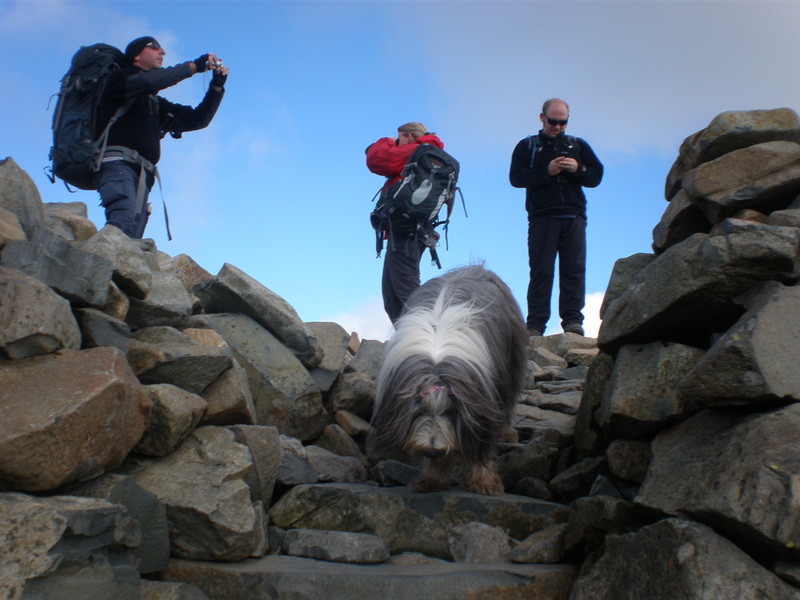 My Camilla was absolutely terrified….well at least she got on all fours to clamber up and show support for me, I think that is what she was doing. Anyway we made it into a gale force wind which knocked me off my feet, ummm, not sure about this hols. On our way down again, hurrah back to the pub, oh hang on they took a turn for the worse and shanked me right up this whopped called Great Gable which is about 899 Metres high and is part of the Scafell cluster, if I thought Kirk Fell was windy ….. anyway time for a quick sandwich and soup break, I got a crust of bread, gee thanks team, and off again. Hurrah I thought as we raced down the mountain, krrrumpph someone went wrong as we hit a ravine with a drop of some horror…all smiles gone, we retraced our steps back up and then down again. 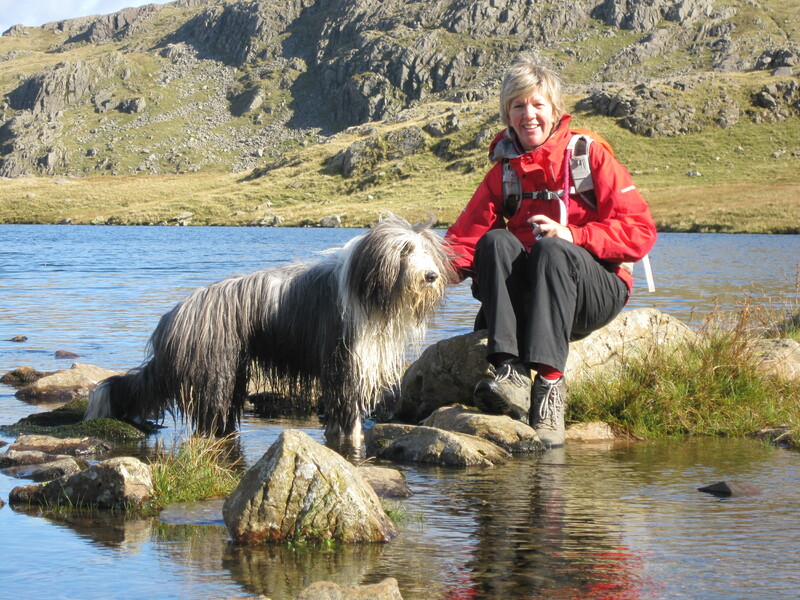 Hang on a minute Millsy, suddenly we are tramping up another hill, what is going on….ah I see Sprinkling Tarn in the evening sunlight, stunning. A group of wild campers are setting up for the night, wow I wish I could….come on girls this would be brilliant we don’t need tents, do we? Right now we are done, back to the ranch for a break, 7 hours of walking is not funny, though it was sunny and dry, secretly I had an absolute cracker of a day. More tomorrow please. OMG I am very excited as today we are on our way to my favorite place, the place of Cumberland sausages and Steak Pie (usually stolen), 358 miles from Sevenoaks (my home), as directed by Emily, Jack and Daniel, the voices of the all new Sat Nav…. We are going to what looks either like a hidden gem or a forboding place called Wastwater!. One of the most remote of the lakes, pretty near the coast at Morecombe bay with clear views to the Isle of Man, which I do not like due to roaring motorbikes with silly men trying to kill each other, AND dogs if they get in the way..
OK so the journey seemed to take six and a half hours, I know as we stopped once and I sat all the way to make sure no one was following us from home, I stole a bit of grub before we left. 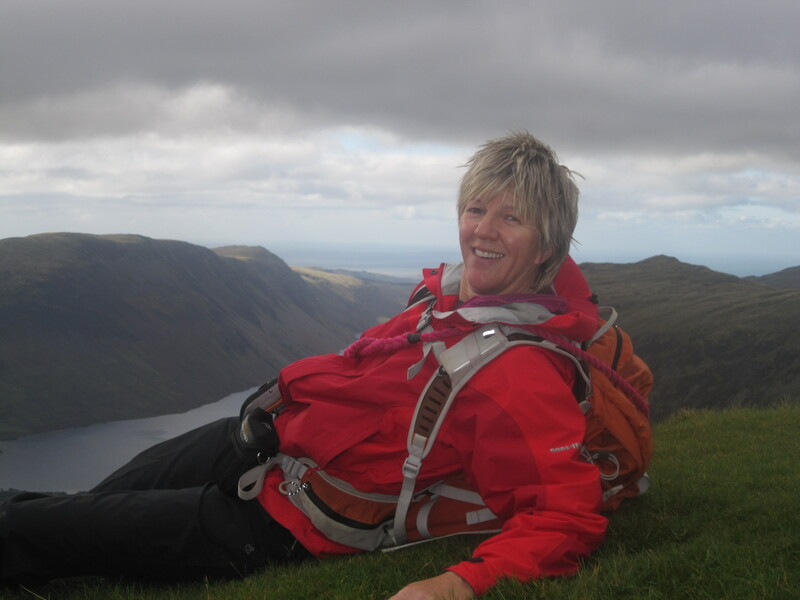 Arrival at 20.17, go Camilla, pub stops serving at 20.30 wahay, Steak pie it is…it has just got better I HAVE MY OWN BED…Wasdale Pub I think I love you. The team seem very impressed with everything so far. Good happy team lots of snacks for me.